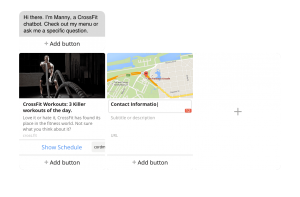 » Chatbots: What Are They and How Can You Use Them? In 2017, we noticed the growing popularity of Messaging apps, as organic reach started to dwindle, along with seeing a growing demand for quicker customer service from brands. While consumers are searching for a quicker, more personalized conversation with brands, those brands are faced with resource limitations, such as being able to respond to every question or answering each request, in a timely manner, around the clock. With this growing issue and chatbots increasing features, the majority of brands are opting to leverage chatbots for their company. Besides a godsend for marketers? Short answer, Chatbots are a scalable, customized solution that allows brands to interact with users in real time without having to have a real human responding to inquiries. Long answer: Chatbots are a computer program that can be programmed to mimic a conversation with a user based on a series of self-initiated task or artificial intelligence can be leveraged to continue the conversation further. Speaking of AI (Artificial Intelligence), a chatbot without some form of AI is like going to In-and-out and not getting Animal style, yeah you went but did you get the most out of it? Utilizing AI with your chatbot, helps you better identify what the user is looking for and providing a better solution, able to use past information to better serve that type of request in the future, as well as detecting the information that will provide the most value for your company and be able to categorize this information for review later. According to a study done by Facebook, 56% of consumers prefer to handle a customer service issue over chat vs. over the phone. As we see this trend continuing to grow, the need for a timely response will grow with it. Most of us, when we think of Chatbots, lead generation isn’t the first thought that crosses our mind. A couple months ago, a car dealership used the technology, along with ad targeting and human follow-up to drive auto sales. As we all know, the longer we take to interact with a prospective client, the greater our chance is of losing them. As mentioned before, most chatbots AI can identify valuable information. This information can be referenced when following up with a lead, allowing for a more seamless transition and a better experience for your potential customer. Facebook is one of the platforms that recognizes the importance of 1-1 messaging and is looking to invest in the growing trend. 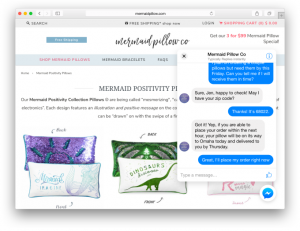 Facebook is currently beta testing Website plugins for their messenger product. This will allow customers to talk directly with businesses on their websites using Messenger, and continue those conversations across the web, mobile and tablet devices. Powering your website chat with a messenger chatbot can enhance the customer’s journey by starting the conversation anywhere (Website, Messenger App, Facebook, etc. ), along with bringing the potential of the end to the Email list Era, by allowing brands to get to know their users more personally and offering a meaningful interaction. 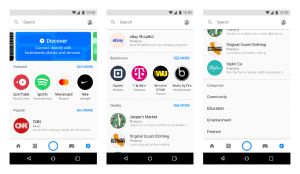 Brands that are looking to embrace a Facebook Chatbot, show take advantage of the Discover tab, Discover tab is a new section in Messenger located within 1 tap from Messenger’s home screen. Before your brand can be shown in this section it needs to pass a Facebook Review process. 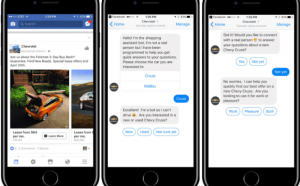 Now that you’ve seen a couple way that Chatbots can be utilized and how they can be leveraged, are you ready to set up one for your brand? If you need help strategizing the best way to leverage a chatbot, setting a bot up, or have any questions contact Anvil.